Is It Legal or Ethical for Your Roofer to Waive Your Insurance Deductible? Allstate Roofing representatives are routinely asked by customers whether it is possible for us to “cover the deductible” on an insurance claim for roof repairs near Mesa. This puts our representatives in a difficult and awkward position. Here, we will attempt to briefly explain the insurance claim process and let homeowners determine for themselves what is a legal and ethical business practice. In the past, “absorbing” an insurance deductible would have been perfectly legitimate for a Mesa roofing contractor. As recently as 20 years ago, insurers gave homeowners lump sum payments when a loss occurred; the deductible was simply removed from that total. In fact, it was not only legal for the homeowner to keep the deductible; it was entirely up to the consumer whether the repairs had to be completed at all. If, for example, you needed to replace your shingle roof after a massive hailstorm, your insurance adjuster may have determined that it would cost $15,000 for a new roof installation. Your deductible was $1,000 so your insurer would cut you a check for $14,000, and it was your business what to do with it. You may have found someone who would do the work for less. You may have found a certified, licensed and bonded roofer who would do the work for more, but you would have to pay the difference. Or you may have decided not to have the work done at all. Now, most homeowners have Replacement Cost Value (RCV) provisions in their insurance policies, and insurers have limited their exposure to RCV insurance claims by breaking down payments into multiple parts. Today, instead of receiving a lump-sum payment for work to be completed, funds for a roof replacement can come in as many as 4 separate checks. The only way to get the full value of the damage paid is to have the repairs actually performed. In that scenario, the insurance company would expect to get a copy of your written estimate from the roofer you have chosen to complete your roofing project. Under this process, the insurance company issues the check in the name of the homeowner, or to the homeowner and their mortgage company. It issues the final check for the amount owed minus your deductible. You are responsible for paying the difference to the roofing contractor directly. There are some roofers out there who will “assume” or “absorb” the cost of your deductible. In fact, some even advertise that they will do this on their signage. What they do is actually inflate the cost of their work on the estimate and invoice they provide to the insurance company. For example, they may say that your re-roofing project will cost $16,000 when it will actually cost you $15,000. These roofers often keep their cost to the homeowner down by paying a lower labor rate or using inferior materials. Not only is this unethical, but many would consider it insurance fraud. It also means that the roofer is using substandard materials or rushing through the job – neither of which is what you want on your home, arguably the most expensive and important investment you own. While you might save yourself several hundred dollars or more by hiring a roofer who will absorb the insurance deductible for you, you may end up costing yourself a lot more in the long run by trading that savings for cheap labor and substandard materials. You should ask yourself if you really want to deal with a roofer who is willing to provide misleading information to the party cutting the checks? Or do you want to pay slightly more to have the job done right the first time, so that your roof lasts for years and gives your home the superior protection you need? 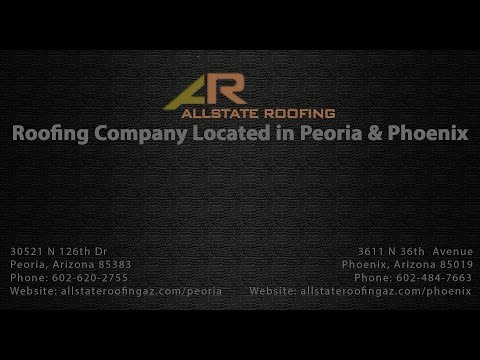 Allstate Roofing is a trusted Arizona roofing company. We have built our reputation through honest, quality work and service. Our –Mesa roofers do not offer to absorb your insurance deductible, because we believe this practice is both dishonest and unethical. We bring that same integrity to the work we do, whether it is a minor roof repair near Mesa or a whole new roof installation. Contact Allstate Roofing of Arizona to get an honest estimate for your roofing work.